As mentioned in my Numenera post, I am currently creating a campaign from scratch. This is very exciting to me. However, it’s led to me re-evaluating how I organize the games I am running. With now three different games, I felt that I definitely need to keep my notes straight. I felt I needed a way to plot outlines and story arcs. Previously, I’ve always been using Evernote. I extensively use the Web Clipper to yank ideas from websites straight into my notes but also, to add the campaign newsletter that I send around for my Runelords campaign. The advantage is that I can use Evernote anywhere I have web access or wifi. This means I can jot down ideas during my lunch break. You can use different notebooks to organize your notes, and tag them. I still don’t feel very organized using it though. Sure, I can favorite notes, and create different notebooks, but I still have to click through my notes or use the search, without having any real way of adding structure. It is however still a great tool for simply taking notes. A ‘jot down your ideas anywhere’ tool. I would like to note that their new pricing model kinda blows. Thanks to my ISP I had Premium access for free for a year. I definitely do not need 10 GB of notes every month nor use all the business features. It would however be nice to sync on all my devices, which was always free until now but which would cost me 29,99 € a year now. Certainly not a pricing that would kill me but a bit over the top just so I can sync on my 3 devices. I deleted it off my phone, and now only use the clients on my PC and my tablet. The web version will have to do when I am not at home. So what to do for campaign management? There are several solutions. There’s Obsidian Portal, but for me, that’s less about campaign management but about being the chronicle of a campaign. It offers a wiki for worldbuilding, a blog, etc. 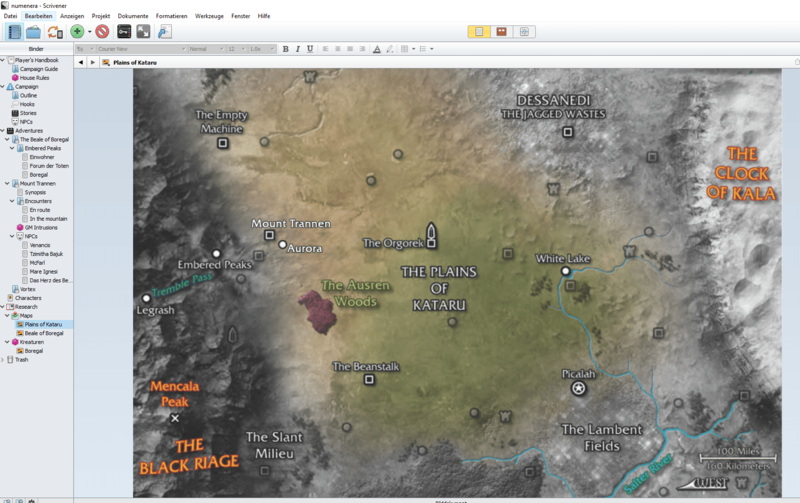 I am doing something similar using a WordPress.com blog as adventure journal for my Legacy of Fire campaign: The Adventures of the Cactus-Slayers. I have lots of plans and little time for this site, but it’s wonderful for showing the creativity of my players and their campaign diaries. What I need is a tool that allows me to structure and plot my campaign, without any worries about player access. I was looking for a software solution. I briefly looked at The Keep, which actually looks to be a fantastic piece of software, but the screenshots didn’t quite grab me. It looks clunky? I dunno, I am probably wrong. There was only a trial version of 1.0, which I didn’t care for. I had long lusted after Realm Works from Lone Wolf Development because based on screenshots and videos I had seen, it does everything that I was looking for. As the software is by the same guys who created my beloved Hero Lab, I was very tempted. However, there were three issues in my way: high price point, no trial version, no way to export data. The last is really the deathblow. You can’t even print any files! I want to be able to add handouts and print them. I want to be able to export notes as PDF or whatever file format I need. Not offering any of that, plus no trial to even look if the software is what I want killed my interest. Which is a shame, it still looks awesome but export is really a requirement for modern software. During my hunt for a campaign management tool, I stumbled over a post at Gnome Stew, which is an excellent RPG site, btw. It gives a comprehensive overview over using Scrivener for managing an adventure. 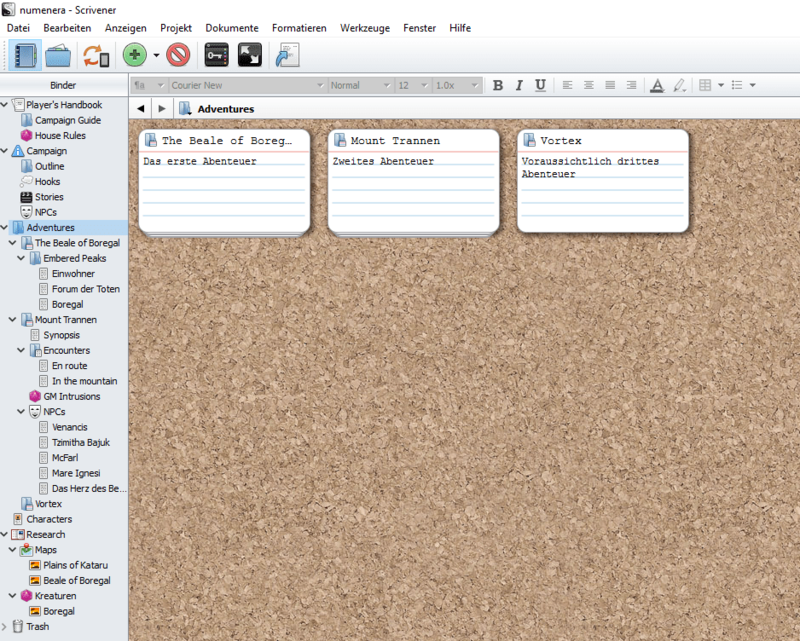 Of course an adventure is only a part of a campaign and thus, you can use Scrivener to structure more deeply. So, what is Scrivener? It’s a creation suite for writers, offering a full word processor, a way to structure writing, create character outlines, revise your writing, keep your research handy, use a name generator if you can’t come up with names, index cards and so on and so forth. Unlike Realm Works, it comes with a free 30 day trial. Not only that, it only counts down 30 days of actual use, so if you really want to give it a spin, that’s a long trial period. Despite its focus on writers, don’t be disparaged, because what is a GM but a storyteller, a writer. Unless you are one of those crazy improv GMs who fly by the seat of their pants. Major kudos to you. I must admit that after first starting the software, it is incredibly overwhelming. It takes you through a tutorial template that is very extensive and will likely take 45 minutes to an hour of concentrated reading and testing. The learning curve seems steep, but it’s really not that bad. Once you understand cork boards and the difference between folders and files, you are really good to go. Also, there are about a million Scrivener tutorial sites out there. Just don’t fall for the ones that want to sell you tutorials, because there’s a lot of good free training stuff out there. Scrivener is template-based. There’s a default template you could work with, or you could do what I’ve done and grab a ready-made RPG template, kindly created by Ricardo Signes. I loaded that into Scrivener. Then I started fiddling, making adjustments, and before I knew it, I was deep into plotting my campaign and prepping adventures. A very bare-bones cork-board for my planned adventures. Scrivener has a so-called Binder as left side-bar. That’s where you create a structure. In my case, I have a campaign section, where I will outline my campaign in broad strokes. There, I also collect story hooks and track major NPCs that will impact the whole campaign, like the Big Bad Evil Guy. There’s a so-called Research folder, which you can use to add external files like images, PDF files, etc. I’ve used that to add images of the maps I am using in my adventures. I’ll also add the PDF files of the character sheets of my players. It will be awesome to track that between sessions. I need a good long look at everybody’s skills and abilities. This will allow me to create GM intrusions and RP situations utilizing those abilities and skills. An imported image file that I am using as an adventure map. Not only can you bring structure into your campaign management, you can also visualize the structure, by assigning icons to folders and files. For NPC folders, I am using a mask, e.g., or for rules sections and GM intrusions I am using a d20. I am sure there’s probably tons more icons out there that could be added to this template. It’s definitely a much more streamlined and organized way of structuring game information than what Evernote offers. I will continue to use Evernote for what the name suggests: taking notes. The fine tuning and detailed planning will happen in Scrivener, which I will happily purchase. One of the things I’ve always struggled with in terms of my DMing prep work using software tools (be it Evernote, Google Docs, or whatever) is the concept of hidden versus known content. What is in front of the Dungeon Master screen versus what is behind it, so to speak. This is one of those things that Obsidian Portal does well, with fine grained controls over who can see what. I’m not necessarily a fan of OP as a planning tool (or even an adventure chronicle tool really), but if Scrivener has that kind of ability I would be very much interested. I seriously wish Realm Works had offered a trial version, I would have loved to give it a spin as well. According to the FAQ they believe that their tutorial videos should be good enough to see if you like it or not. Much like Fantasy Grounds, as much as I love the concept, the pricing model drives me insane. One more example of “the dungeon master pays.” Sadly typical in this gaming space. I desperately wish the industry would do more to cultivate more DMs/GMs/Storytellers. Its almost like they forget that the number of people running games is one of the big things limiting the growth of the hobby and their customer base. Make the DM tools cheap, or free even, so that you don’t need to buy three books (or shell out for subscriptions) just to then turn around and do the hard work of actually generating the content.